What do folklore, yak cheese, Chinese dams and the Dakota pipeline all have in common? Energy and social science. 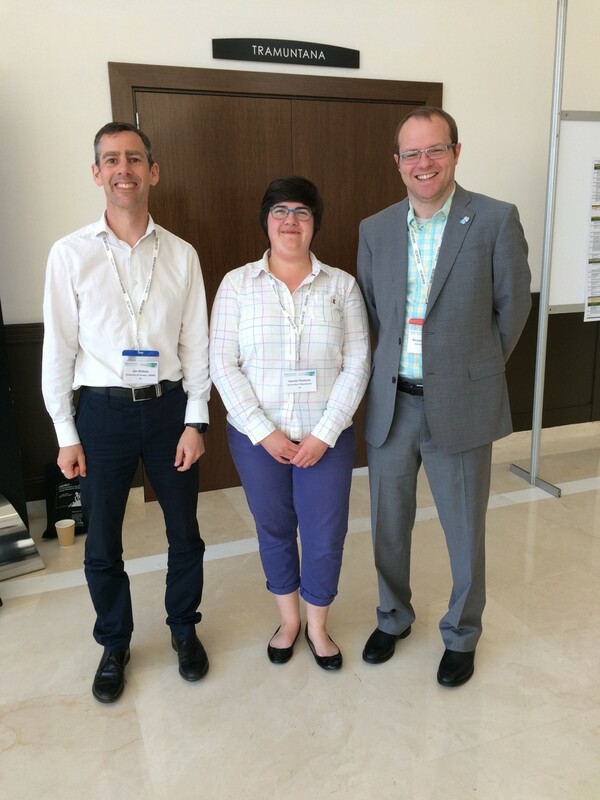 The First International Conference on Energy Research and Social Science, held on 2-5 April in Sitges, Spain, aimed “to spotlight what the wonderful group of energy social scientists both represents, and can accomplish,” according to Professor Benjamin Sovacool, Director of the Centre on Innovation and Energy Demand. In his opening keynote speech, Sovacool highlighted the reasons why energy researchers not only need, but want to use social science. The conference was organised by Elsevier and linked to the journal Energy Research & Social Science. Air pollution leads to around 6.5 million deaths each year, according to the International Energy Agency’s report which linked energy, air pollution and health. This means that air pollution is the fourth largest human health concern. We need social science approaches to tell the different stories, narratives and discourses linked to energy, its production, consumption and impacts. Mithra Moezzi suggested that we could, for example, look to folklore as an approach for telling energy stories, and many of those stories were indeed presented at the conference. As highlighted by Professor Jim Watson in his keynote on day three, we live in uncertain times in terms of world politics, and this will influence how we predict, or can predict what future energy trends might be. Many of the talks related energy issues to politics, justice and inequality. My own talk focused on low energy housing in the UK, and the challenges we now face without adequate political support to decarbonise the UK’s rather inefficient housing stock. Kirsten Jenkins from CIED presented on socio-technical approaches to energy justice, while Giovanni Frigo told of his experience of researching communities protesting against the Dakota Access Pipeline, many of whom are there for the sake of future generations. Fuel poverty factored in many of the conference presentations and posters, with different countries approaching the problem from different angles. Mue I spoke about the rise of fuel poverty in Japan following the Fukushima nuclear accident and the consequent rise in energy prices. At present Japan barely discusses fuel poverty or economic poverty, but many people are struggling with their energy bills in a post-Fukushima world and 2.6% of Japanese households now face fuel poverty. 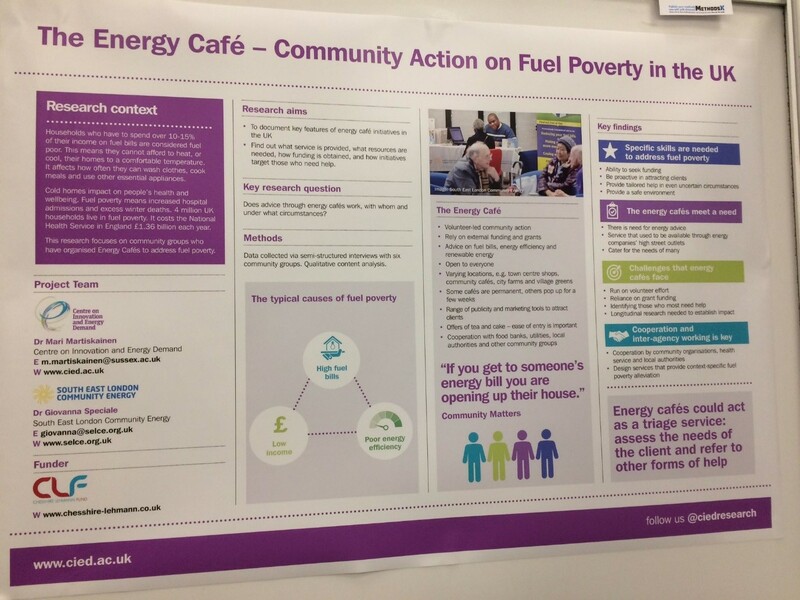 The Centre on Innovation and Energy Demand‘s work with South East London Community Energy on community-led Energy Cafes addressing fuel poverty was part of the poster sessions. Clearly, fuel poverty is an issue that still needs further work. Different countries are still defining what it means to be fuel poor, as presented by Niall Kerr. Work by Harriet Thomson on fuel poverty in the wider EU might help in that process. The power of the community, or in many cases the power relations and inequalities of communities linked to large energy projects came up in Professor May-Tan Mullins‘ keynote on day two. With the pressure to provide sustainable energy especially for many developing countries in Asia and Africa, China has become the biggest dam builder in the world. But these processes are not easy or without controversy, with issues such as inadequate environmental impact assessments, displaced communities and lack of social licence to operate causing environmental, political and social problems. And finally, the yak cheese? Ben Campbell is helping to install a yak cheese factory in the Himalayas that will provide energy via anaerobic digestion (using yak poo). Let’s hope Elsevier will make this a regular conference, as there clearly is a community of scholars who feel passionate about providing fair, just and sustainable energy for all. Photo Credit to United Nations ‘Air Pollution in Toronto‘. All Creative Commons.